Critics are attacking California Gov. Jerry Brown for vetoing a 2016 bill aimed at mitigating fire risks from utility equipment. “He has done nothing to harden those assets,” said GOP state Sen. John Moorlach. Wildfires have consumed more than 221,000 acres since Thursday, killing at least 44 people. California Gov. Jerry Brown’s decision to veto a 2016 bipartisan bill aimed at mitigating wildfire risks from power lines and utility equipment has become the focus of critics as fires rage across the state. Two years later, Moorlach said the state agencies and utilities have made little progress in mitigating the risk of wildfires faced by communities across the state. Brown’s spokesman Evan Westrup told TheDCNF that critics of Brown’s 2016 veto were “exploiting tragedy and peddling bunk to score cheap political points.” CPUC news director Terrie Prosper also defended Brown’s veto. 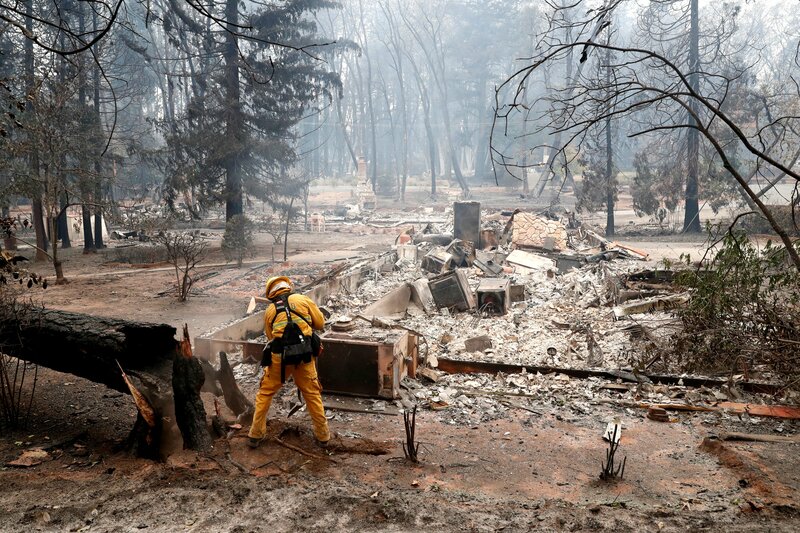 “Senate Bill 1463 would have prolonged the safety work already going on at the CPUC by requiring the participation of certain entities, which was unnecessary because CAL FIRE was already a party to the proceeding, and local governments and fire departments could also participate,” Prosper told TheDCNF. Brown, however, did sign legislation in September that would dedicate some funds raised through California’s cap-and-trade program to forest management. Moorlach supported the bill, but said Brown should have acted sooner to mitigate wildfire risks. Brown has largely framed wildfires as the product of man-made global warming. On Sunday, Brown said “those who deny” global warming contributed to the fires. Moorlach said Brown’s concern about the climate was “inconsistent” with his 2016 veto. Firefighters inspect a property destroyed by the Camp Fire in Paradise, California, U.S., November 13, 2018. REUTERS/Terray Sylvester. “It’s sort of become his religion,” Moorlach said of Brown’s global warming fervor. The 135,000-acre Camp Fire destroyed thousands of structures, including engulfing the entire northern California town of Paradise. 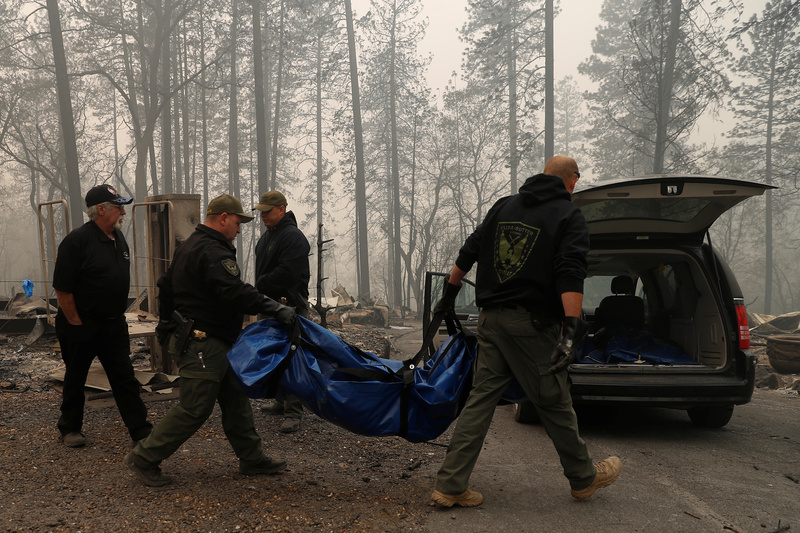 The Campre Fire resulted in at least 42 deaths, making it the deadliest blaze in state history. It’s not clear what exactly caused the fire, but local media reports suggest PG&E power lines may be to blame for the deadly fire. 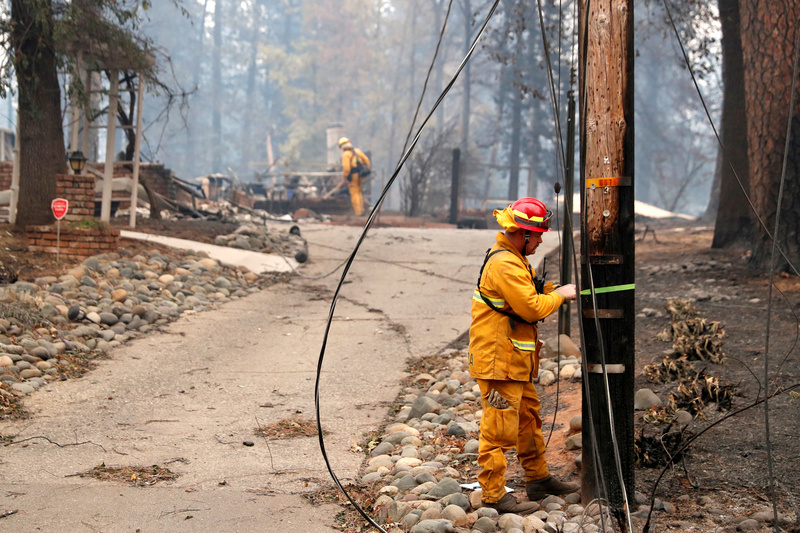 PG&E said it had problems with a power line minutes before the Camp Fire started. Landowner Betsy Ann Cowley said PG&E needed to access to her property in Pulga because “they were having problems with sparks.” The fire started on Cowley’s land. Cal Fire also blamed PG&E power lines and equipment for deadly wildfires that ravaged northern California last year. Those 16 fires killed at least 44 people and destroyed hundreds of structures. In southern California, the 96,000-acre Woolsey Fire killed at least two people as it made its way to the iconic beach city of Malibu. Utility SoCal Edison said “a circuit relayed out of the Chatsworth Substation about two minutes before the blaze broke out,” CNN reported. This article has been updated to include a statement from Brown’s office.